Manufacturers have spent lots of time to develop a stunning configuration for Moto Z2 Smartphone. Iris scanner, curved displays and new aspect ratio, it has everything that can make a new model standout against a big crowd in the market. Moto Z2 is designed with unique design that focuses over Motos Mods and the high tech back panel provides new functionality. This phone is compatible with almost all carriers of US, provides impressive battery performance and you will also be able to get a high quality headphone jack option. All these features make Z2 as a top rated smartphone for 2017. So if you are planning to buy a new phone then you should go through the detailed review below; probably you will soon make up your mind to invest on Moto Z2. It offers 2 day battery life when used with MotoMod. You will definitely be impressed by its Premium Build quality. Z2 is well rated for its stunning performance. The camera quality is definitely incredible. Beautiful aesthetics and well designed system. You will not find the aging processor choice good. Price range is quite high than its predecessors. Moto Z2 has released into market on July 6 and it is now available on several online stores via Verizon. In US, for the course of total 24 months, you can get Moto Z2 with payment of $17/month. Within few weeks, people can avail this smartphone with a price tag of $499 only in the nearby retail stores. Moto Z2 is currently available in four attractive colours, gray, gold, blue and black. This smartphone appears almost similar to Play Droid and Moto Z Droid when we talk about design. You will find band of metal on side portions of this device along with the power button and volume buttons. The back panel is finished with matte metal appearance and you will also notice the camera bump as well as few magnetic attachment pins that are dedicated to Moto Mods. Total dimension of this device is 6.1x3.0x02 inches and the overall weight goes up to 5.1 ounces. Well designed bezels are added to upper and lower portion of screen but they make it quite hard to operate device with one handed operation. It also contains headphone jack and a USB-C charging slot at bottom portion whereas top portion handles MicroSD card and SIM card slot. The memory card capacity is extendable up to 256GB. With a well designed water repellent coating, this smartphone becomes capable enough to resists against splashes. Screen brightness for this device is well adjusted so that users can access it well even at outdoor locations. Colours are often distributed with saturated and deep ambience whereas with night mode enabled you can expect warmer tones with fine color temperature adjustment. If you have already used Moto Z Play and Moto Z then you will definitely find this new model just like hybrid of both these predecessors. The frame appearance is well improved with smooth aluminium finish on body. It works with snapdragon 626 that provides 10% faster speed as compared to Z play that use to work on 625. You will be able to find 4GB RAM along with internal storage space of 64GB. As, 626 is not able to support larger displays screens so it is limited to 5.5 inch with resolution rating of 1080p. Other than screen, you will find few aesthetic differences in this device as compared to the predecessors. The new round shape of fingerprint sensor looks quite impressive and its wider design assists in easy activation. 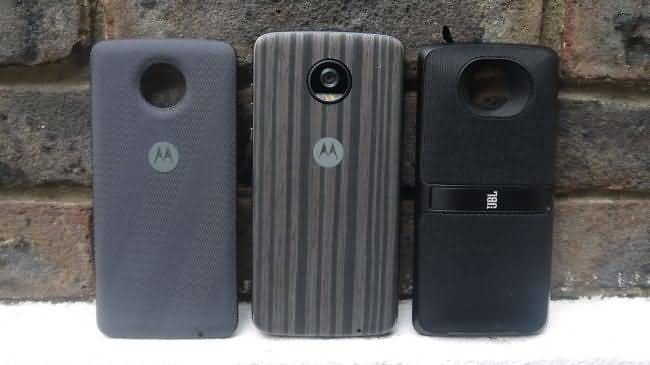 The battery shell for this device is 17% lesser where you will find 3000mAh battery but this design selection leads to a slimmer look for Moto Z2. You will find the front camera of Moto Z2 somewhat comparable to its predecessor but yes it’s quite good. On the other side, the rear camera is G5’d that has faced a major fall drop 16MP to only 12MP but at the same time, aperture has been expanded to f/1.7 range. Manufacturers have also merged the phase detection autofocus and dual focus pixel option into this device to make its camera performance more accurate. You will definitely feel impressed with its daylight shots as they deliver higher accuracy, impactful brightness and stunning sharpness. At the same time, we didn’t find any trouble in its low light performance because it was capable enough to adjust focus to much better level even with challenging light situations. The only trouble noticed about Moto Z2 is its camera speed; the old image processor technology is not capable enough to stay tuned to today’s desired digital speeds. This camera also finds some difficulty to boost up the ISO level on time so that blurry subjects can be avoided and shutter speed can deliver accurate performance. Moto Z Play was well rated for its superb battery performance in 2016; the same quality is continued for the new Moto Z2 design. It can easily last for 2 days when you operate this device with attachment of Moto Mod Battery. You will be glad to know that Moto Z2 provides little higher battery performance as compared to its predecessor and it happens just because of the addition of 10% higher clock speed for this new chipset. So, we can say that performance of Z2 is little upgraded when compared to the older series devices of Moto. This phone is observed to work well up to 8 hours and 18 minutes even if person keeps on watching full screen videos with maximum brightness level over LTE. In case if you need more power then you should switch to TurboPower Pack mode that can provide excellent boost over performance. Also, you can avail fast charging feature with its included Turbo Power adapter. Z2 extends support to LTE bands, UMTS, GSM and CDMA. This device allows users to easily operate on US carriers while including services for Verizon, T-Mobile, Sprint, and AT&T. During the T-Mobile testing, this device delivered awesome performance for uploading and downloading with value falling somewhere around 17.6Mbps and 14.3 Mbps respectively. Other protocols for connectivity include NFC, Bluetooth 4.2 and dual band Wi-Fi. It provides decent performance for phone calls as voice transmission is observed to be quite impressive. It provides great noise cancellation property and conversations were just fine. The earpiece option is quite impressive with distortion free sound transfer that suits best for the noisy environments. This device is loaded with Android 7.1 Nougat. You will be able to find some of the most popular Moto apps in this smartphone like Moto Voice, Moto Display and Moto Actions etc along with Google Pixel XL. Although, all the older smartphones of Moto series are going to have new software update by this year but Moto Z2 is already found to have all latest features in it. You will be glad to know that this recently launched Moto device is designed with Thumbnail quick access feature so you need not to unlock your phone every time. There is no doubt to say that Motorola has reflected the best improvement for display technology and it is now going to give a great competition to Google, LG and Samsung. One more interesting feature added to Moto Z2 by this year is its “Show Me” that works in assistance with Moto Voice Suite. With this advanced application, user can easily launch any application on screen by just saying “Show Me X”. Everything on this phone appears really good and simple to use. You can access weather, twitter and routine schedule etc by simply using voice commands with Voice Search API. The screen scaling options for this device are also much improved so now you can easily fit more icons on device screen. You will definitely love the launcher as it leads to impressive performance. You will definitely love to use its gesture based control ability where twist opens camera, chopping opens flashlight and if you swipe down the screen then it will automatically enable one handed operation for Moto Z2 screen. With the price tag of $499, Moto Z2 offers impressive set of features. The long battery life, great aesthetics and its ability to handle all US carriers very well makes it suitable for all android lovers. The greater flexibility for application management and advanced software updates make Moto Z2 best choice for your next purchase. But, this device doesn’t carry the fastest processor and there are several devices having resolution setting little higher as compared to Z2. So, if you are more concerned with speed and resolution then you may need to search for options; however for beginners, this device is best choice by means of suitable price range, user friendly interface and great looks.